Here is a high quality clasp with a twist design. 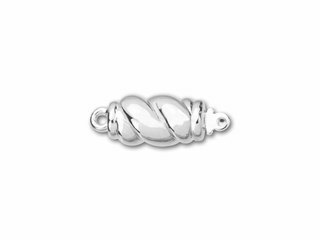 This box clasp features a tubular shape with an elegant twisted dimension. It's sure to add a sophisticated finishing to a pearl or other diminutive design. It is versatile in size, so you can use it in necklaces and bracelets. Box clasps are easy to open and close, yet remain strong and secure, so your jewelry will stay in place.